Our 2019 Conference & Exhibition Keynote speaker, Jennifer L. FitzPatrick, is gearing up for speaking at KSLA’s Conference on May 15, 2019, and she requests our input in preparing her remarks. Ms. FitzPatrick’s keynote address is entitled “Boosting Occupancy and Staff Retention Through Generational Collaboration.” To make her presentation as relevant to our members as possible, we ask that you complete a short survey. From this valuable feedback, Ms. FitzPatrick will tailor her presentation to issues related specifically to our members and their communities. To take the survey, Click Here by April 30. There are six provider member seats opening on the KSLA Board of Directors: President, Vice-President, Secretary, Treasurer, and two Members-At-Large. Terms of service begin July 1, 2019. All nominations must be submitted no later than April 29, 2019. Board members for these six seats will be elected at the 2019 KSLA Conference & Exhibition on May 16, 2019. Click Here to nominate yourself or someone else for the KSLA Board of Directors. Provider Registration is Now Open! New This Year: We’re offering on-line Conference registration and payments! Click Here to reach our Provider Member Registration site. Or if you prefer, you can still download the Conference Brochure for Provider Members, complete the last two pages, and send them to KSLA with your payment information – same as last year. New This Year: We’re offering an “Early Bird” discount for those Provider Members who register prior to Thursday, April 19, so be sure to take advantage of that opportunity! After April 19, there is a slight increase in conference registration fees. The final registration deadline is Tuesday, April 30. New This Year: “Split” Registrations – Can’t make it to both days of the Conference? That’s OK! “Split” your registration with another person from your community! One person attends conference activities on Wednesday, May 15, and the other person attends conference activities on Thursday, May 16. Just indicate this option on your registration form or when registering on-line. Providers, Click Here to register for the 2019 KSLA Conference & Exhibition. Exhibitors, Click Here to register for KSLA’s 2019 Conference & Exhibition. Non-Profit Exhibitors, Click Here to register for KSLA’s 2019 Conference & Exhibition. The deadline to register is Tuesday, April 30, 2019. 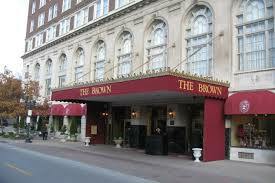 KSLA has reserved a block of rooms at a preferred rate of $142/night at The Brown Hotel. Make your reservation by Thursday, April 25, 2019 to qualify for this preferred rate and be sure to use code 051419kysla. After April 25, the rate will increase to normal rates, which range from $195-$306/night). Click Here to Book Your Room at The Brown Hotel.